Zion National Park needs no introduction. Famous world-wide for it’s stunning panoramic mountain views and sheer sandstone cliffs, Zion is home to epic hiking, canyoneering, and camping. And guess what? Within minutes of the park, you can be fly fishing on one of the numerous lakes or streams nearby. 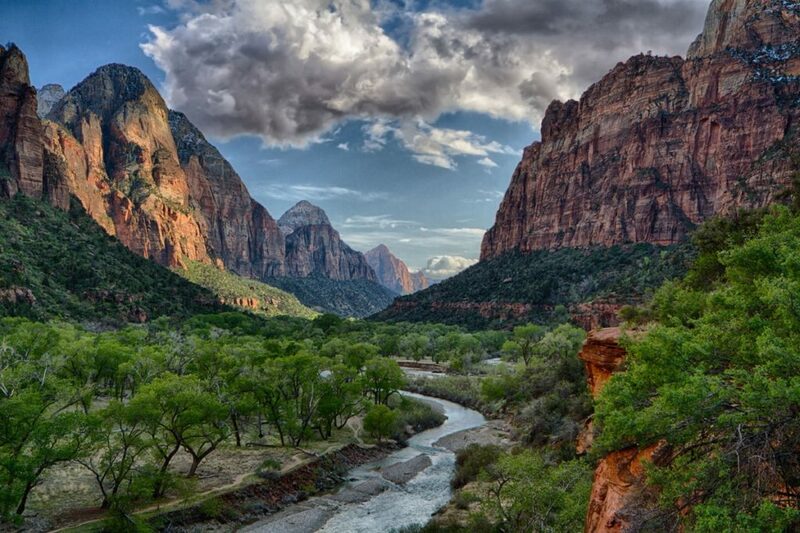 This makes a perfect addition to your visit to Zion National Park. Our trophy trout lake is located 20 minutes from the east entrance of Zion. A few minutes farther north, blue ribbon streams await. Kolob Reservoir, a blue ribbon trophy lake, is home to large rainbows and cutthroat and is 30 miles from the park. It forms the headwaters of the Virgin River drainage. The north fork of the Virgin River is the river than runs right through the middle of Zion National Park. Click here to learn more about Kolob Reservoir. Also nearby is Navajo Lake. Navajo Lake is unique in that all the water from the lake drains through lava tubes into the Virgin River waterway. Navajo is not deep, so the rainbow trout have a hard time surviving the winter here. This led to the stocking of splake, a cross between a lake trout and brook trout. These big fish are thriving in Navajo. Click here for more about Navajo Lake. Moving west from Zion National Park, more fly fishing awaits at the warm water fishery of Sand Hollow State Park. With large bass, this reservoir draws people from all over the west for it’s fantastic fishing. Click here to learn more about Sand Hollow. 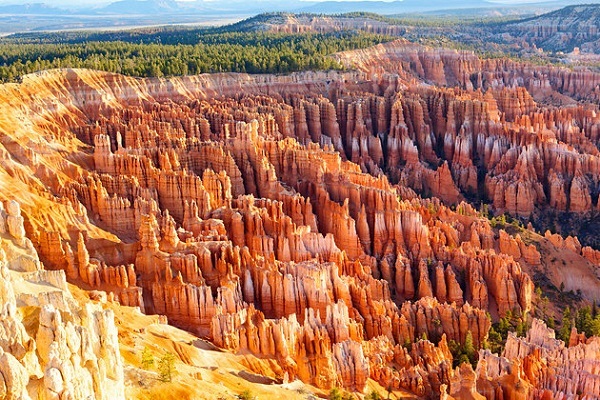 Bryce Canyon National Park boasts the largest collection of hoodoos in the entire world. 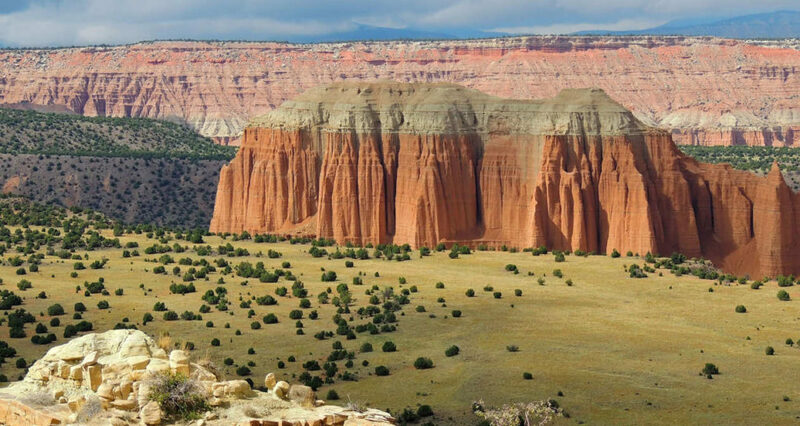 Hoodoos are “odd-shaped pillars of rock left standing from the forces of erosion”. The pillars soar upwards, seemingly ready to topple at any moment. The hikes that weave in and out of these hoodoos are spectacular and must be experienced, providing hours of exploration. Click here to learn more about Bryce Canyon National Park. Our favorite waters to fly fish around Bryce Canyon are located to the north and include two blue ribbon streams and reservoirs. These stretches are some of the best in the whole of Southern Utah if solitude is what you’re after. About 30 miles to the west of the park is the blue ribbon reservoir Panguitch Lake. “Panguitch” means “big fish” in Paiute, and this holds true still today. Panguitch Lake is home to big Bonneville Cutthroat Trout, Utah’s state fish. Click here to learn more about Panguitch Lake. With so many majestic features in Capitol Reef, it’s hard to take in the surrounding areas. But you should, because fantastic fishing awaits. West of the park is productive blue ribbon streams and reservoirs, the biggest of which is Fish Lake. Home to numerous species of fish including lake trout, splake, rainbow trout, and yellow perch, Fish Lake is a beautiful alpine lake with majestic scenery. Click here to learn more about Fish Lake. Just 20 miles south of the park is Boulder Mountain. With over 80 fishable lakes on this high elevation plateau, there is something for everyone. Camping and hunting are also popular on Boulder Mountain.